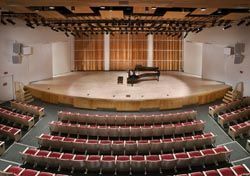 The sound system at 450-seat Merkin Concert Hall was designed around the flexible DSP and interface capabilities of Symetrix' SymNet line of processors.NEW YORK, NY-The 450-seat Merkin Concert Hall in Manhattan's Kaufman Center hosts more than 60,000 concert-goers every year. It recently underwent an overhaul of seating, lighting, rigging, and sound reinforcement as part of the Kaufman Center's $17 million renovation. Ben Bausher, consultant in the audio and video systems group at JaffeHolden, designed the new sound system around the flexible DSP and interface capabilities of the SymNet line of processors, and Larry Politi, senior project manager at SPL Integrated Solutions, oversaw its installation. Because most of the complaints about the old system centered on its overall fidelity and usability, Bausher was able to leave most existing microphones, mixers, and other front-end gear in place. He replaced the existing loudspeakers with an EAW array. Four EAW MK-series full-range loudspeakers comprise the hall's main left-right system with front-fill provided by six UB 12s-series loudspeakers. Two EAW SB150 subwoofers provide low-end support, and six EAW SM-series monitors provide reference for the musicians on stage. 50 Atlas Sound D161-8s distribute sound throughout the rest of the building. Five Lab.gruppen C28:4s and one C16:4 power the system. One SymNet Express 4x12 Cobra DSP provides all of the processing for the main speakers. Bausher programmed the unit with a heavy reliance on SymNet's loudspeaker management modules, in addition to some supplemental equalization and gain. A SymNet Express 8x8 Cobra DSP handles all of the auxiliary systems, from infrared to backstage to the lobby, and, according to Politi, "contains all of the interesting control logic." These include priority overrides for volume control, ducking algorithms for paging, interface with a bank of SymNet ARC controllers, and a nest of modules that serve to modify the behavior of other modules, such that the functionality of the entire system appears seamless and straightforward from the user's perspective. Located on Manhattan's upper east side, the Kaufman Center is a multi-art organization comprising the renowned Merkin Concert Hall, the Lucy Moses communication arts school, and P.S 859, a NYC public school for musically gifted children. "JaffeHolden's almost exclusive use of SymNet products came down to two things," said Bausher. "First, we like SymNet's variety of DSP blocks and are especially partial to SymNet's all-important automixing and loudspeaker processing algorithms. The units are easy to program and deliver stellar audio quality. "The second deciding factor is SymNet's line of ARC controllers," he continued. "That's where all the DSP companies are really differentiated. We find that the flexible architecture of the ARC controllers makes programming complicated functionality in a comprehensible way straightforward. Importantly, each controller is relatively inexpensive, so it's no big deal to combine a lot of them." Bausher implemented the Merkin Concert Hall's nine ARC controllers in a non-standard way, using custom-engraved faceplates to depict the specific functions of each controller. Three ARC-SW4s each provide four push-button momentary switches; two ARC-SWKs each combine four similar switches with a rotary knob; two ARC-MICs each combine four similar switches with a built-in condenser microphone for ease of paging; one ARC-EX4 expands the push-button capabilities of the ARC-SW4s; and one ARC-EXK expands the bank's functionality with a rotary switch.